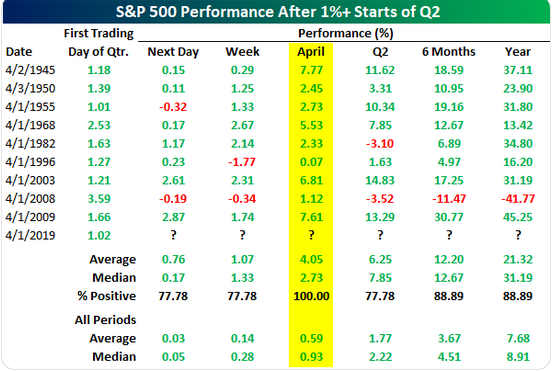 2.Since WW2, the S&P 500 has started April with a 1%+ move nine times. 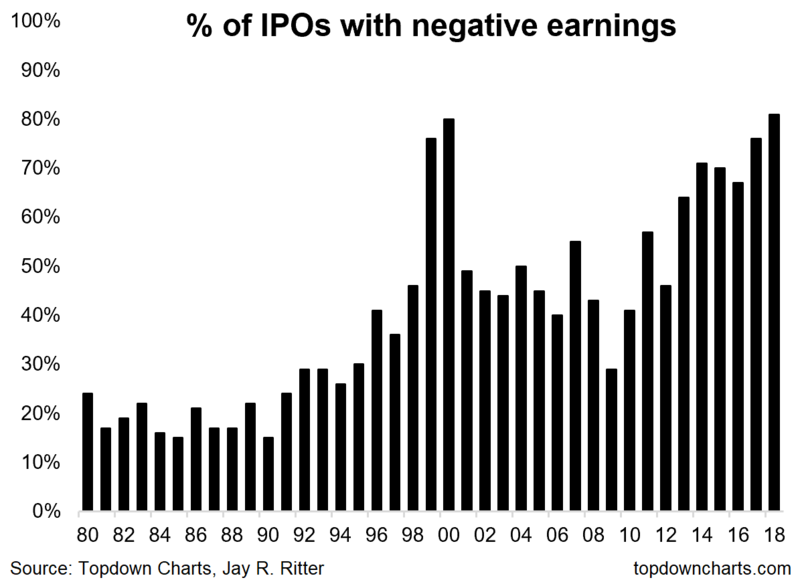 4.Percent of IPOs with Negative Earnings. 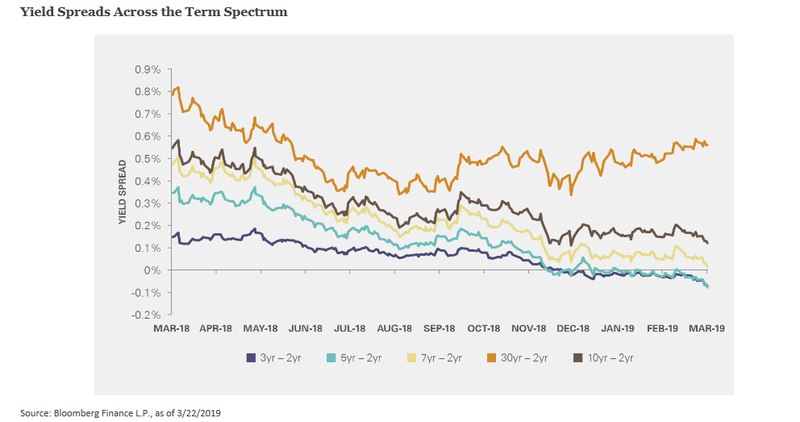 5.Yield Spreads Across the Term Spectrum. 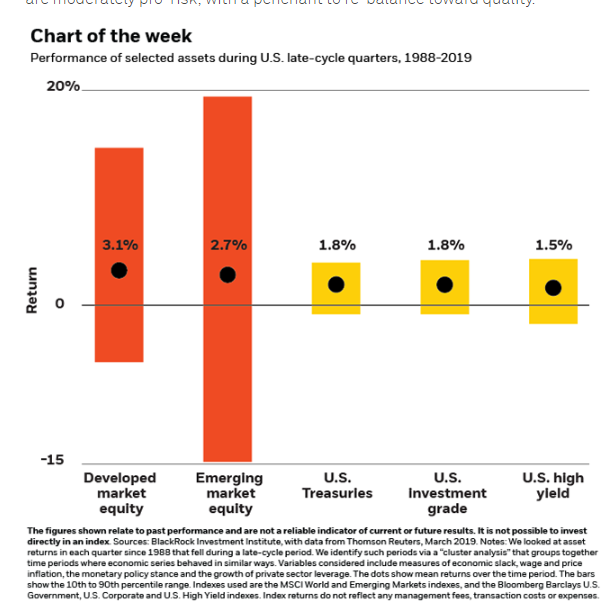 6.Rates Down…Negative Yielding Global Debt Up. 7. 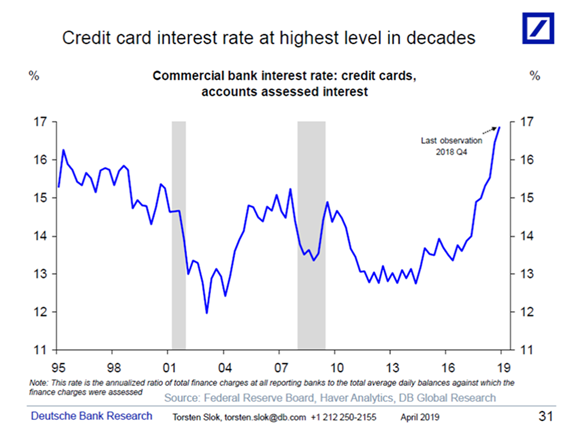 As Rates Go Down….Rise in Credit Card and Car Loan Interest Rates. 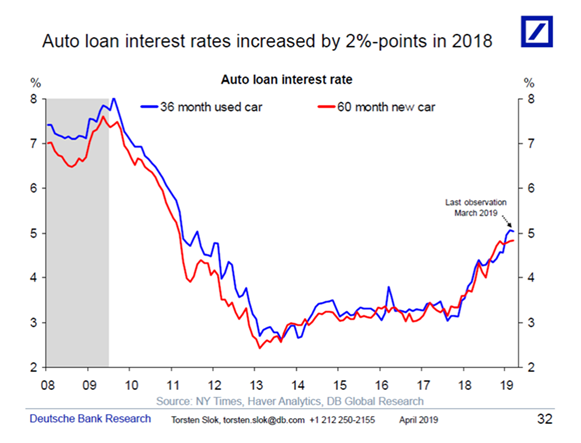 One important downside risk to the outlook is the recent increase in credit card and auto loan interest rates, see charts below, in particular in light of the ongoing weakness in retail sales. For more see also here. 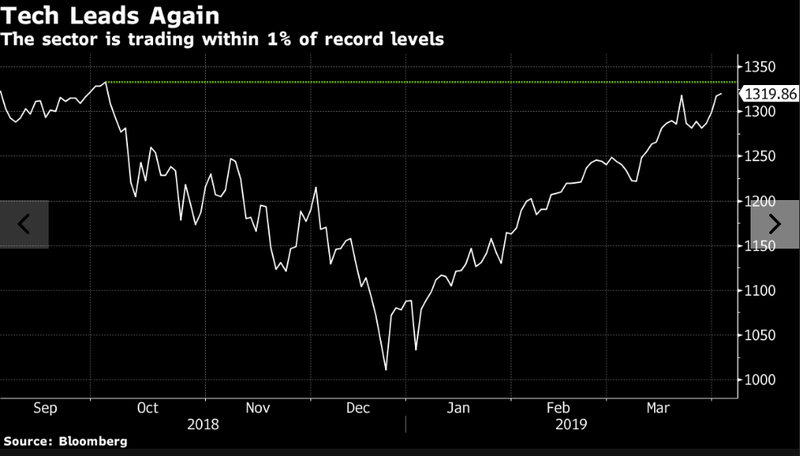 9.Tech Only 1% From New Highs. Let me tell you a quick story about one of my clients. When we first started working together, Dave was a ‘good’ entrepreneur. From the outside looking in, many would have argued ‘great’. He was hardworking, disciplined, and had a genuine desire to serve his clients and improve the lives of everyone he meets. But when we first sat down together, he shared something that disappointed me. Now, why would this goal disappoint me? Because Dave was already making $10,000 a month from his business. And his unreasonably small goal of hitting $15,000/mo wasn’t just holding him back from more income–it was doing a disservice to the thousands of people in his community who need his services. With a goal of that size, there’s no real ambition, no hunger, no drive to go out and excel. So I challenged him to elevate his thinking and shoot for something even bigger. Taking my advice, Dave did indeed 10X his thinking and within five months he grew his business from $10,000 to $50,000, and after six more months, he broke the magical $100,000 mark. You see, too many of us have our “Success E-brake” cranked all the way up. We’ve set mental limits on how much we can do, have, and become for no good reason. If people like my friend and mentor Joel Marion can go from a broke school teacher to a 7-figure entrepreneur in only 12 months, and then go on to build a 9-figure business in just 18 months, and if Kylie Jenner can become a billionaire at the age of 21, then why can’t you hit your first 6-figure month before the year is out? If Jim Kwik can drive more than 10,000,000 downloads to his podcast in only two years, what’s stopping you from hitting 100,000 downloads by the end of this year? If my friend and client Jason Capital could take his business from $0 to $1,000,000 in only 9-months at only 23-years old, why can’t you double your income this year while working less? Want to know the fastest ways to stunt your growth, distort your view of reality, and develop an over-inflated sense of importance? Spend all of your time around people living at or below your current level of performance. When you spend your days surrounded by people singing your praises, complimenting your work ethic, and acting as if you’re the greatest thing since sliced bread (who came up with that ridiculous idiom anyways–unsliced bread is just as good) you develop what I call the “Big Fish, Small Pond” syndrome. You falsely believe you’re a King among mere mortals and can do no wrong. But what you don’t realize is just how many opportunities you’re missing. To elevate your success and income, you must first elevate the environments and individuals with which you spend your time. Sure, I could go to my little local Stratford Chamber of Commerce meetings every week in my hometown, I’d be the richest (although definitely not the smartest) person in the room and have plenty of value and insight to offer. But this type of environment is a breeding ground for complacency and would stunt my ambition and focus faster than taking up the drinking habits of my father. If you fail to surround yourself with individuals playing the game of life at a higher level than you, you will never achieve the impact, income, or lifestyle you desire. This is why you must invest your time and money in masterminds, events, summits, and workshops. There’s no shortage of opportunity and no excuses holding you back from taking advantage of them. If a shy, and “introverted” person like me could go to 6+ events per year during my most socially anxious years (2006-2011), you can escape your bubble and spent time in bigger, better, and more inspiring environments too. The number ONE reason I am where I am today is because I’ve spent the past 20-years surrounding myself with BIG thinkers. With people who are smarter, faster, and better than me and can call me out on my weaknesses when necessary, and raise my thinking to a higher level. The Small Fish-BIG Pond is the lifestyle for me. It’s uncomfortable to swim in bigger waters, but it’s the only way you’ll grow. You can make $1,000,000 by selling a $1,000 product to 1,000 people. But finding those 1,000 clients is an unnecessary challenge. Instead, find a way to develop a $10,000 product and sell it to 100 people. Or better yet a $25,000 product sold to 40 people. Yes, creating premium products and services will require more time up front and significant effort to refine and sell your offer. But at the end of the day, it’s a much faster way to scale your business and create the life you deserve. When you offer more value and charge more for your services (more on that later), you allow yourself to earn the income you desire without putting in back-breaking work weeks or insane hours. For example, I have clients who pay me $25,000 for one day of consulting. Most times, they get their marching orders and are never heard from again because they are too busy taking action and dominating their path. They’re the Operators who take the strategy we create together and run with it. And that’s exactly how I like it. These $25,000 clients–clients who are found exclusively in big ponds–are the ones I want and the ones I hunt for everyday. Or, take my friend and business partner Bedros Keuilian, CEO of Fit Body Boot Camp. Although he wants to have 2,500 franchise locations, he doesn’t want to have 2,500 franchise owners. Instead, his goal is to have 2,500 franchises owned by only a few hundred franchisees. It’s more work to train and retain these owners, but in the long run, they’re less hassle and far more effective for sustainable growth (I, for example, own three FBBC locations). When you can get fewer higher paying clients writing bigger checks, the game will change forever. Your job is to figure out how you can create a premium experience in your business so that you can charge more and have fewer (but better) clients. Three of my top Alpha-Female clients: Stacey, Lori, and Jenn run group coaching programs where they can give restricted access to the “Guru” (e.g. 60-minute weekly group coaching calls) to hundreds of people for a moderate investment. This simple business model allows them to make far more money than they would with one-on-one coaching where their income is limited by the amount of time they can invest each week. When you can deliver your services one-to-many or find a way to sell massive bulk orders of products (like Bedros did with his ManUp! Book, selling 7,000 copies through speaking alone) you can acquire customers and scale your income much faster. In my business, workshop and mastermind groups are one of the best ways for me to deliver coaching because everyone wins. My clients get an amazing day of personal coaching from me and the “Mastermind Effect” of being in a room with 5 to 25 other high-performers. Everyone, myself included, gets more value in less time. How can you apply the “Bulk buy” concept to your business? What offers can you scale, systematize, and grow to generate more revenue and create a bigger impact on the people you serve? Do you think Oprah runs to the supermarket for a fresh bag of avocados, edits her own videos, checks her inbox, or spends hours a day mired in menial administrative work? And, as the CEO You Inc, you must become the Oprah of your own business. You are the superstar and you must treat yourself as such. Do only the things you can do and outsource the rest to someone else. Get an in-person assistant to run your errands (or use a service like Instacart). Hire a video editor to create clips for your social media channel. Find an email copywriter to create your promotions. Get a housekeeper, meal delivery service, dog walker, landscaping company, and anything else that makes your life easier and more convenient so that you can focus on what matters most. Become selectively lazy and STOP doing the things that are below your pay grade. If your hourly rate is $100/hour, why would you waste your time on a $10, $25, or even $50 task you could easily outsource to someone else? Every hour you spend on tasks that don’t drive massive profits and build your empire is an hour that you have actively lost money. Right now, I want you to identify at least four tasks you are currently doing that do not need to be done by you. Figure out how much it will cost to outsource them and do this NOW. To do great things, you must first do fewer things. I learned this lesson the hard way in 2016 when I flew here, there, and everywhere to speak at other people’s events and masterminds. Whether I was earning $2,500 or $5,000 I took any engagement I could find. And, as you might guess, this lifestyle quickly became unsustainable and after one particularly exasperating trip, I decided to stand up for myself and say, “Enough is enough.” I’m going to get paid what I’m worth. Today, when people ask my speaking fee, it’s always $25,000. No discounts. No exceptions. 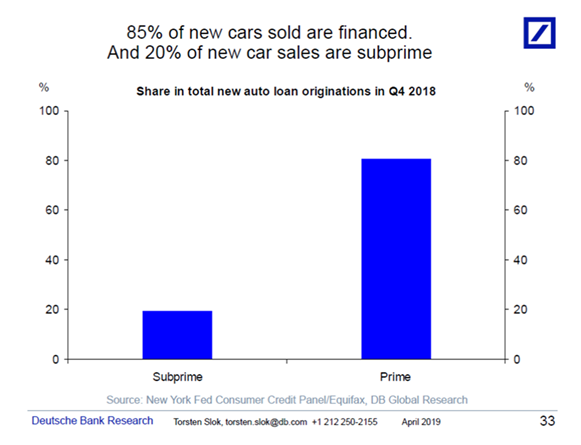 Most people won’t pay it…and that’s fine. Because even at $25,000 for 90-minutes on stage, each speaking gig to which I agree actually costs me four or five days in lost focus and progress on my business. I know my worth and I demand that I’m paid it. Do you know exactly what you’re worth and, more importantly, do you have rules in place to ensure that you consistently get paid what you are worth? If you’re struggling to make the income you desire while still maintaining balance throughout the rest of your life, you must STOP taking on $500 speaking engagements that distract you from your biggest goals. You must STOP accepting “poor fit” clients that cost you more in stress and anxiety than they pay in dollars. You must STOP agreeing to underpriced projects that will eat away at your energy and focus without paying you what you really deserve. What rules must you apply to your life and business to ensure you are never paid less than you’re worth again? Through the careful and consistent implementation of these rules, my schedule has been liberated, my income is higher than it’s been in 18 months, and my life (not to mention my sanity) has been reclaimed. Now it’s your turn. It’s time for you to draw some hard lines and remember your role as the Superstar of your business. Do only what you can do–and get paid what you’re worth to do it. Love it or hate it, you can’t argue with the fact that everything is easier in life when you have more celebrity. Imagine that you walk into a busy restaurant a few moments before The Rock. There’s only one table left…who gets it? Sorry, but it ain’t you. It doesn’t matter that you arrived first. Celebrity wins every time. Heck, even if you walk in before a local newscaster you’re still not getting that table. It’s not irrational, it’s just reality. And if you try and fight it, you will lose. However, if you flow with it, you can use it to your advantage to achieve the success you desire faster while radically improving the quality of your life. But how do you actually go about manufacturing celebrity? Easy. The same way it’s been done since Charlie Chaplin became famous in 1915. If you aren’t doing video, specifically making vide a daily practice, you’re going to get left behind. This does not mean you need to publish every video you record, simply that you must practice recording videos and sharing your message on a daily basis. Test out different pitches, cadences, tonalities, and gesticulations. Use different camera angles, play with lighting, practice in the morning and evening. Figure out what works for you so you can use video to its fullest advantage. And, if you’re up for a serious challenge, I encourage you to go out in public and make a video in a crowd full of strangers. When you can do this comfortably, you’ve officially made it to the big leagues. Second, in addition to your daily video challenge, you’re going to schedule a 60-90 minute block for content creation during your perfect week planning. … And walk away with enough content to fuel an entire week (or at the very least, a couple days) of YouTube, Facebook, and Instagram content. Try it out this week and share your social media handle or a link to your YouTube page where you implemented it below! Most entrepreneurs have a fundamental misunderstanding about the topic of pricing. I recently increased the price of one of my flagship programs from $297 to $397 and guess what? The product continues to sell the same way it did before. Knowing what I had to offer was worth far more than $297 (and in reality worth more than even $397), I decided to increase the price, thus earning an extra $100 for every sale I made. To get paid what you’re worth you must continually review your offers and ensure you are not giving away too much. Don’t get trapped in the paycheck prison by promising too much to too many people. Yes, you should always over deliver on value and give people more than what they paid for. But you must also ensure that you can consistently deliver that value by charging a fair price for your time and energy. And to do this, you must take your total investment of time and energy into account. For example, when you do over-the-phone coaching for $350 an hour, you aren’t making $350 an hour. When you account for all of the preparation, follow up, transitions, and other “time vampires” that go into a single call, you’ll quickly realize you’re making half–maybe even a quarter of what you’re charging for that hour. The solution? Raise your prices and charge what you believe you deserve. 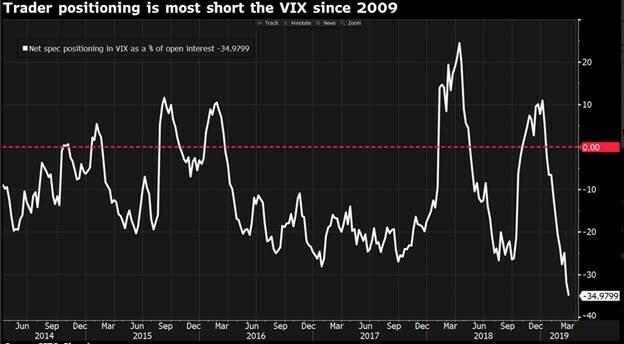 Stop short-selling yourself and allowing your clients and customers to steal more of your time, attention, and energy than they’ve paid for. No one will raise your prices for you or voluntarily offer you more money. You must take the first step and stand up for yourself and the life you desire. To achieve the success you desire, elevate your thinking, and generate the impact and income you deserve, you must turn yourself into a predator–a sales shark, if you will. You must go out into big open waters looking for the sale every single day. Constantly ask yourself what needs to be done–what outreach, promotions, emails, cold calls, etc–to achieve your sales goals. Do not allow your head to hit the pillow before you’ve put in the effort necessary to make that next big sale in your business. Remember: This isn’t a hobby, it’s your livelihood. You can only eat what you kill, but if you learn how to sell, you will eat very, very well. And if you’re already financially successful and find yourself unmotivated by the prospect of another ‘0’ in your bank account? Then shift your focus away from yourself and towards the people you want to help by remembering that the more you succeed, the more other people can win. Success is not an option. It is your duty, your obligation, and your responsibility. You and I still have a duty and an obligation to sell our services as hard as possible so we can change as many lives as possible. Creativity, much like focus, willpower, and yes, your biceps, is a muscle. And like any muscle, it can be grown and improved with consistent effort and intentional practice. Often times, the factor holding you back from the success you desire isn’t that you lack the skills or resources to achieve your goals, but your lack of creativity and ingenuity. It’s easy to get stuck in a mental rut of doing and thinking about things the same way day in and day out. It’s easy to get complacent in your thinking and approach every problem from the same angle. By adopting Altucher’s daily practice, you can remedy this stagnant thinking, improve your creativity, and discover unique ways to improve yourself, your life, your business, and your world. The practice, as powerful as it might be, is incredibly simple. Everyday–yes even on the weekends–when you wake up, spend just 5-10 minutes writing down 10 new ideas. They can be ideas about anything. It doesn’t matter what ideas you write down as long as you write down ideas. The goal here is not to write down good ideas, simply to get ideas out of your head and onto paper. Most of your ideas will not be good. Many of them will be terrible. And that’s ok.
Because your goal is only to find the one idea that makes all the difference. The greater volume of ideas you produce, the greater the likelihood that one of them will be the idea to take your life to the next level. If it takes 1,000 bad ideas to get there, that’s ok. Practice this habit every day and, eventually, you will uncover the idea that will change everything. You must remember that any goal or outcome that has been achieved by others can be achieved by you. Others have gone before you and paved the path. All that’s left is for you to walk down it each and every day. If someone else has the ability to build a 7-figure business, travel the world, have the balance, family life, and fun they desire…So can you. 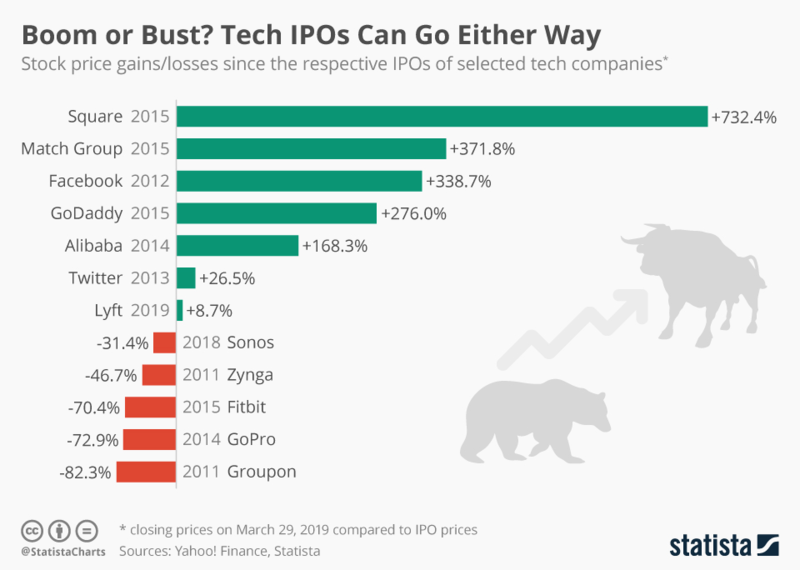 If someone else can disrupt an industry, become a billionaire, and change the world (for example, Elon Musk), so can you. If someone else can find the love of their lives, do work that matters, and enjoy vibrant health, abundant wealth, and lasting fulfillment… SO CAN YOU. But doing requires that you first believe in yourself and cultivate a growth mindset. You can have, be, and do anything to which you set your mind. IF you are willing to pay the price. If it’s been done before, it can be done again. But you must first believe that you can do it. And then you need the blueprint for getting it done. I can help you with both of these key elements in my coaching program. Send us an email at Support@EarlytoRise.com for more details.